Giving Arnold some love, isn’t he handsome?! Hi! My name is Renee and I am a Senior Buyer in the Merchandising Department at SmartPak. Being a Senior Buyer doesn’t mean that I get to spend all day buying new horses but it does mean that I get to help select and also develop the fun products that we feature in our catalog. In other words, it’s my dream job. I am thankful each and every day I come to work that I found a job I am so passionate about. 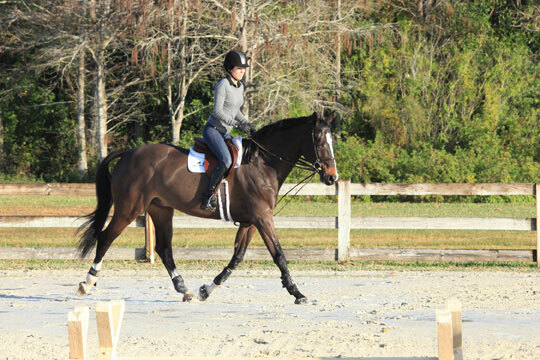 I’ve been with SmartPak for almost 7 years now, but time flies when you’re having fun! I’ve loved horses since I can remember and it’s a dream come true to work for a company like SmartPak. I spent a lot of time riding naughty horses and ponies growing up. My favorite story is of a naughty pony that bucked me off and then kicked me in the air on my trajectory to the ground. How rude, right?! But I loved riding, so I got back on and never quit. Since I have been working at SmartPak and attending the photo shoot in Wellington it’s been a big dream of mine to actually show there. 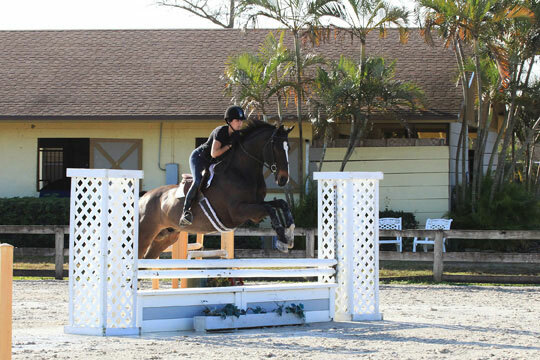 Wellington is kind of like a fantasyland for hunter/jumper riders. I’ve always loved being a spectator at the Winter Equestrian Festival and hoped one day I’d get the chance to show myself. I mentioned this to my husband a few times (or maybe it was a hundred times, but hey who’s counting) and we decided that as my Christmas present this year, I’d get to lease a horse and show for a week! I was fortunate to get to show a horse that I’d ridden a few times at home (he also happens to have been a SmartPak model on many occasions). His name is Fenway Park – yes, he’s a Boston boy – and he goes by Arnold in the barn. He is super-athletic, brave, kind and a blast to be around. And his ears are always up and ready for the camera – he loves to model! So this past January, after a busy four days of photo-shooting and one lesson I was off to the show for my first class, the Ariat National Adult Medal on Saturday. I felt nervous but surprisingly confident. My goal was to find all of the jumps and end the course still in the tack with both feet in my irons. Not the loftiest of goals, but they at least seemed realistic. Well, Arnold was fantastic! We laid down a nice trip and just ended up 1 spot out of the ribbons. I was happy with the way I rode and felt very thankful to have such a wonderful horse to ride. 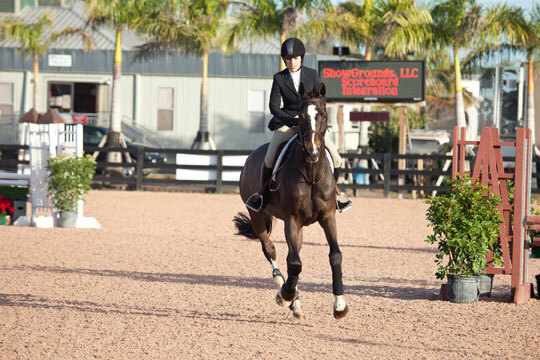 The next day I was in the Palm Beach Adult Medal and the two Adult Equitation OF classes. I made a last minute decision (long, short, long, short… and chip :)) in the Palm Beach Adult Medal and we didn’t get a ribbon but I put my game face on for the Adult Eq and ribboned in both classes! Probably the most expensive ribbons I’ll ever win but I was proud of them and proud of myself! It felt like it was over so fast, and I was sad to leave. I wanted to stay another week and improve with Arnold – I felt I was just getting the hang of riding him. As a working adult amateur I don’t get the chance to show horses other than my own, and there is definitely a learning period associated with getting on an unfamiliar horse. I’m a competitive person at heart and I wanted to go back and continue to build on my last week. But my JetBlue flight was non-refundable, I’d spent all of my money and I needed to be back to work on Monday! We’re in the ring at WEF! I hope that I’ll have this opportunity again next year; time will tell. But I had a wonderful time, made some great memories and checked off an item from my bucket list. Wow! What an inspirational story! Renee, you have the life that I want,lol seriously! My dream job is to work for smartpak and to hopefully one day ride my horse in a one star or even two star event. You made me more determined then ever to finish school (I’m a junior in college) and Chase my dreams like you did! Job well done and congrats! 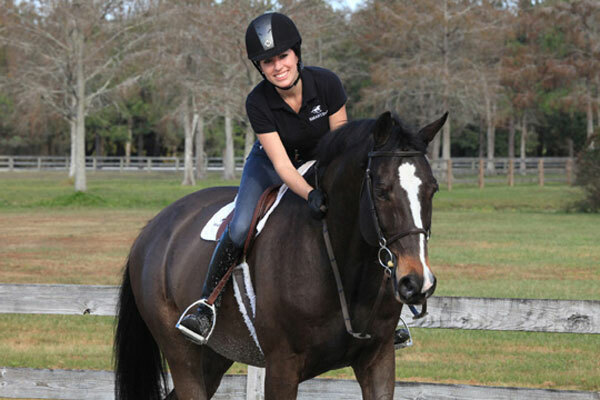 I live in Stuart Florida and am also interested in Smartpak for a career. Any advise on how to get into the company?